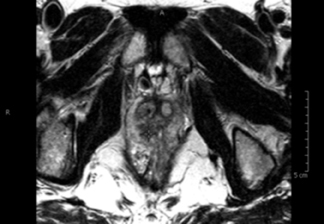 A 63-year-old male patient was referred by his urologist for multiparametric magnetic resonance imaging (MRI) of the prostate gland,following previous negative prostate biopsy. The patient’s prostate-specific antigen (PSA) levels remained elevated, most recently 10.8 ng/ml, despite Avodart. Additionally, this patient had undergone colectomy. Multiparametric MR imaging was performed to acquire high-resolution images through the prostate gland and seminal vesicles. A suspicious region measuring 1.2 × 0.8 cm was identified in the right midland/base (Figure 1), abutting the central zone right of midline, coursing along and invading the right ejaculatory duct. It demonstrated restricted diffusion (Figure 2) and was concordant on multiple sequences,making it amenable to MRI-guided biopsy. 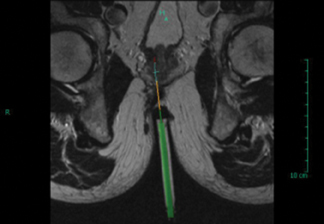 Following anorectal resection, CT-guided transgluteal prostate biopsy is often considered because it is both safe and effective;3 however, our institution has a transrectal MRI guidance system (Figure 3) with a very small needle guide that could be easily accommodated by the neoanus (Figure 4). The patient returned approximately 2 weeks later for MRI-guided biopsy. He underwent oral antibiotic prophylaxis and Betadine was applied to the neoanus prior to insertion of the needle guide. Viscous lidocaine was used as both a topical anesthetic and lubricant for insertion. Once in place the needle guide was imaged with a T2-weighted calibration scan in the sagittal plane and the target was relocalized.Planning software was used to calculate the delta between the tip of the needle guide and the lesion. 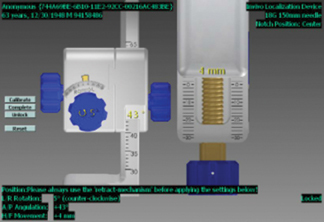 Angulation and insertion adjustments were made in the A/P, L/R and H/F directions (Figure 5). 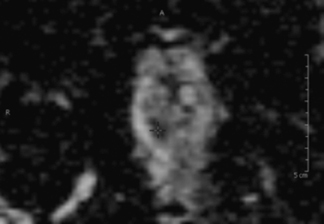 The suspicious region was relocalized and targeted from a T2-weighted axial image (Figure 6). 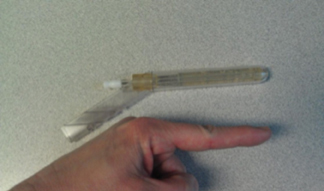 Four core biopsy samples were taken using an 18-g, 175-mm, fully automatic, MRI-compatible gun. The specimens were placed informalin and sent for histological evaluation. The patient tolerated the procedure well, and after brief observation and demonstrated ability to void, was discharged to home. Final pathology report: Prostate, right peripheral zone base, MRI-guided needle biopsy showed diagnosis (Figure 7). MRI of the prostate has earned its place in the diagnostic armamentarium for prostate cancer detection. 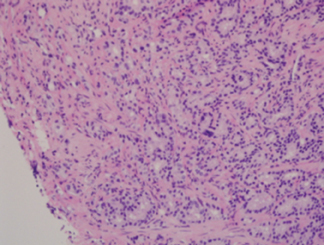 Recent literature and experience have proven its value for cancer diagnosis, grading and staging when used to target specific areas of the prostate gland for biopsy.2 In the unusual clinical scenario of the patient presenting post-abdomino-perineal resection (APR), MRI-guidance may be used when insertion depth is adequate, providing more control and less radiation than transgluteal computed tomography (CT) guided prostate biopsy. Multiparametric MRI and MRI-guided biopsy are helpful to target specific areas of the prostate gland for biopsy, even in patients who have undergone colectomy. Sciarra A, Panebianco V, Cattarino S, et al. Multiparametric magnetic resonance imaging of the prostate can improve the predictive value of the urinary prostate cancer antigen 3 test in patients with elevated prostate-specific antigen levels and a previous negative biopsy. BJU Int. 2012;110:1661-1665. Yacoub JH, Verma S, Moulton JS, et al. Imaging-guided prostate biopsy: Conventional and emerging techniques. RadioGraphics. 2012;32:819-837. Cantwell CP, Hahn PF, Gervais DA, et al. 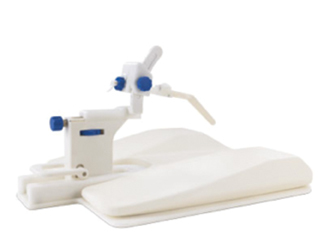 Prostate biopsy after ano-rectal resection: Value of CT-guided trans-gluteal biopsy. Eur Radiol. 2008; 18:738-742. MRI-guided prostate biopsy in a patient post colectomy. Appl Radiol. Prepared by Dr. Walker while at CDI Woodbury Cornerstone in Woodbury, MN, by Ms. Greenwood, BSRS, RT(R)(MR) while at Invivo, Pewaukee, WI, and Mr. Malecha while at Metro Urology in Woodbury, MN.